Roku customers who can't find enough stuff to watch and/or listen to on the platform have a new weapon in their search for stuff: the Roku Channel. The Canadian version of the channel went live on the morning of July 23 (the U.S. version has been available for a while) and offers a selection of movies, TV shows and the like in one location – kind of like about a thousand other channels you can put onto the Roku, such as Shout! Factory TV and ,many, many others. And the content is all free! That doesn't mean you don't pay for it, however (since nothing in life is ever free! ): you do have to suffer through commercials, though Roku claims its Roku Channel is, according to the press release, "expected to average about a third less advertising per programming hour than ad-supported linear TV in Canada." I get the feeling that "linear TV" line means "conventional broadcast and/or cable/satellite TV", and if that's the case you could be saving a lot of wasted commercial time. Assuming the claim is true. And it may be true. The first thing I watched in my admittedly limited time on the Roku Channel so far (there are only so many hours in the day!) – a one hour-ish Beatles documentary – was interrupted twice, each time with two commercials. It wasn't too annoying, though as with other "commercial" free channels on the Roku, the interruptions appear to happen based on time rather than content, which means the program can be interrupted right in the middle of a scene, or a word, with no obvious break. But since this isn't limited to the Roku Channel (I've noticed it on others, including the abovementioned Shout! Factory TV), I'm not going to single it out any more than I have already. "We always aim to deliver the best entertainment selection and value for our customers," said Rob Holmes, Vice President of Programming at Roku. "Our users are looking for great free content, and with the launch of The Roku Channel we are making it easy for them to find it." The Roku Channel requires no subscriptions, fees or logins other than the account you set up when you first install your Roku and fire it up (I assume it works the same for Roku-equipped TV's). That initial setup requires you to register a credit card, but that's only in case you decide to access premium content; I've never had a charge on my card because of my Roku account, so it doesn't seem like a big deal unless you're really concerned about hacking etc. 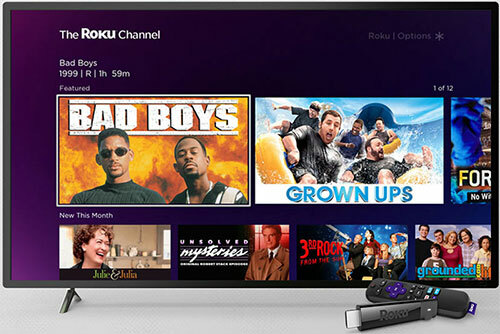 As of the channel's launch, "Rokusers" can access hundreds of movies, TV shows and documentaries for free streaming, and Roku says that they're planning to feature a selection of box office hits and great classic movies every month. Initial offerings include Bad Boys, Julie & Julia and Grown Ups, none of which interest me (your mileage may vary, of course) and a "curated selection" of content from some of the existing channel publishers on the Roku platform. According to Roku, publishers participating at the launch include American Classics/Hatch Farm Studios, FilmRise and Total Content Digital. The company expects others to be added over time. The Roku Channel displays its content via categories such as TV, comedy, drama, action/thriller, music, travel and nature, martial arts, history, horror, classics, royals and Brits, westerns. Heck, there's even an "all-Ernest channel" that gives you the "classic" Ernest P. Worrell films starring Jim Varney! Even if you find the Roku channel underwhelming (I have to admit I'm more interested in what's to come than in what's there already) you can still find oodles of stuff to watch, listen to, or play elsewhere on the device. Roku says its streaming platform offers "more than 5,000 free and paid for channels that offer access to 150,000 movies and TV episodes." As per by Sturgeon's Law (according to the famed science fiction author Theodore Sturgeon, "90 per cent of everything is crap"), there's a pile of poop out there, and that means you'll have to go looking for stuff that turns your crank. But it's there! Since I've been using Roku I've watched the usual stuff like Netflix and YouTube, but I also use their Accuradio app all the time to stream that company's great free musical content (though you can't save favourites or make your own playlists on the Roku version like you can via their app or website). I've also partaken of classic country music videos, standup comedy, classic TV and movies and more. I love it, even though what I watch merely scratches the surface of what's out there. You can also use the Roku to stream your own stuff if you archive music, videos and/or photos on your local network. The quality of the stuff, whether you mean audio, video, writing, acting, or whatever, is all over the map (another application of Sturgeon's Law? ), but it's amazing what you can find – and I'm only talking about the free stuff. If you want to pay for subscriptions, there's an even wider world on the Roku. Heck, you can even shatter old pop culture tropes! I mentioned in an earlier Roku review that I was drawn to the pilot episode of The Beverly Hillbillies, a series I watched religiously with my parents when I was a nipper, and discovered that – contrary to what Lester Flatt and Earl Scruggs told us in "the Balland of Jed Clampett" – he wasn't shootin' at some food when up from the ground came bubbling crude. Nope, he had a big pool of oil on his property that I imagine is similar to Alberta's much maligned (and very important) oil sands and wasn't out shooting at all! Mystery Science Theatre 3000 fans will find a lot of stuff, too, and – though I forget what channel it was one – the Roku gave me the chance to visit a guilty pleasure from the 1970's when I discovered the old sci-fi flick "A Boy and his Dog" was there. Again, this just scratches the surface of what's on Roku. Roku's user base can add the Roku Channel from the Roku Channel Store – just like they add other stuff – and start using it immediately. I doubt this is going to be a really huge thing for Roku and its users, but I've been wrong before (or have I?). Besides, far be it for me to bemoan someone offering consumers more choices for the same price.